Hatchery expected to produce 35K trout for river fishery and Long Island State Parks. Oakdale, NY - October 23, 2014 - Governor Andrew M. Cuomo today announced that the Connetquot River State Park Preserve hatchery will reopen next year, helping to reinvigorate the rich trout fishing tradition on Long Island’s Connetquot River. The Environmental Protection Fund will pay for $150,000 in upgrades to the historic hatchery, which will begin this winter. The hatchery in Oakdale has been closed since 2008, after Infectious Pancreatic Necrosis (IPN) was detected. Though harmless to people, IPN is a contagious disease that can be fatal to young fish of the Salmonid family, including Rainbow, Brook and Brown trout. State Parks has since worked with the Department of Environmental Conservation (DEC) to eliminate IPN from fish in the river and develop the plan to reopen the hatchery. To reduce the chance of a reinfection, the project will install a bio-secure well and generator to provide a fresh supply of groundwater to the hatchery. Project work will begin this fall. Fish cultivation is expected to begin in 2015, with the first trout release occurring in late 2016 or early 2017. 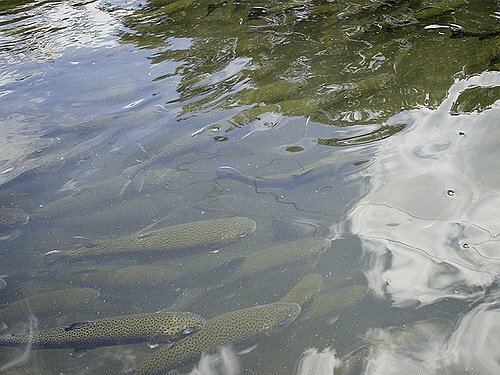 The new system is expected to eventually produce 30,000-35,000 trout 12 inches or greater in size on an annual basis, restoring the Connetquot River fishery as well as providing trout for Caleb Smith State Park Preserve and other Long Island parks. Until the hatchery is at full production, the park will continue stocking the river with outside sources of trout. The project is funded by a $150,000 Environmental Protection Fund grant awarded through Governor Cuomo’s Regional Economic Development Council initiative. The Friends of Connetquot and other local fishing clubs will contribute $10,000 to purchase eggs needed to begin cultivating fish. Reopening the hatchery continues the Governor’s efforts to improve access to outdoor recreation and promote hunting and fishing opportunities in New York. Since 2012, the Governor’s NY Works initiative has supported a total of $421 million in capital funding to undertake 179 improvement projects at 109 parks and historic sites. Governor Cuomo launched the NY Open for Fishing and Hunting Initiative to improve recreational activities for in-state and out-of-state sportsmen and sportswomen and to boost tourism opportunities throughout the state, while maintaining New York’s fishing and wildlife programs. In support of this initiative, $10 million in NY Works funding has been dedicated to fish hatchery repairs and 50 new land and water access projects such as boat launches, hunting blinds, trails and parking areas. According to a 2013 report by the American Sportfishing Association, New York ranks second only to Florida in angler expenditures. Sportfishing has a total impact of nearly $4.5 billion and supports 32,000 jobs in New York State. The 3,473-acre Connetquot River State Park Preserve was founded in 1866 as the Southside Sportsmen’s Club and acquired by the state in 1973. Deer and waterfowl are plentiful, rare nesting birds, including osprey, are present and there are numerous rare plants in their natural habitats. The preserve also has 50 miles of hiking, horseback riding, cross-country ski and nature trails. Subject: LongIsland.com - Your Name sent you Article details of "Governor Cuomo Announces Hatchery to Reopen and Restore Trout Fishing on Connetquot River State Park"